To close out its current season Opera Theatre St. Louis has chosen a Mozart masterwork that, while sometimes remains forgotten in context with his other operas, is filled with enough intrigue, power politics and deception that it could be ripped form today’s headlines. The biggest takeaway from the company’s production of Titus is to not trifle with the affections of the human heart. In this case it would be Vitellia, the daughter of Rome’s deposed emperor who has eyes for Tito, the land’s oligarch. The problem is that Tito has his eye on his friend’s sister, Servilia. But here’s the rub, Sevilia wants nothing to do with marrying Tito and persuades him to drop his marriage proposal. This is where it gets ugly. Scorned by Tito, Vitellia sets a plot in motion to assassinate the emperor by cleverly enlisting the aid of Tito’s best mate Sesto, who is himself in love with Vitellia, to do the deed. For his part, Sesto is not really keen on killing his friend but he sees no way out of his quandary. At this point, without a Kardashian in sight, Tito knows he must marry and decides her will ask Vitellia for her hand after all. However by the time he decides to do this Vitellia’s plan has reached the point of no return as a reluctant Sesto makes an attempt on the Emperor’s life. The assassination attempt throws Rome into chaos as fires, fighting and bedlam break out. Sesto, deeply troubled by betraying his best friend is placed under arrest, forcing the second act’s climactic confrontation between Tito and his former good friend. 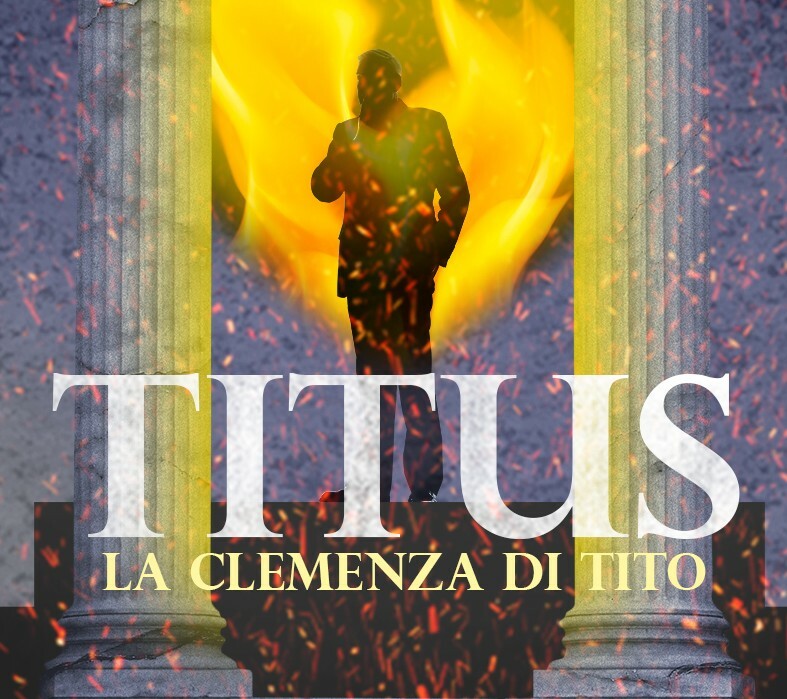 Although Titus is a revenge-infested maelstrom, an ensemble of amazing talented performers stabilizes the drama through heady waters. Because Titus generally features women playing prominent males roles onstage, which opens the door for two sterling mezzo-sopranos, Cecilia Hall and Emily D’Angelo (as Sesto and Annio respectively) to shine. As Sesto, Hall is mesmerizing in a performance that is one of the season’s finest. Hall gives Sesto a troubling aspect ideally suited for the treacherous path he embarks on. D’Angelo is also a breakout star. Laura Wilde is astounding as Vitellia in a turn that finds her more than capable of headlining in a difficult role. Returning to Opera Theatre again Rene’ Barbera once again delivers a stellar presentation as the emotionally torn Tito. The set is relatively sparse, save for a massive Aquila Eagle, which serves a symbol for the power of Rome. At the start of the opera it hangs over all of the events on stage, reminding the audience of the all-consuming power of the Emperor. It then falls, symbolizing the threat that envelops it before once again resting atop its perch as all is revealed. It’s a clever technique to convey emotion and underscore the upheaval on stage. after four decades. This has clearly served as a motivator for the musicians who follow him to create one of the company’s richest scores in years. Lord’s precise and delicate score is emotionally charged, poignant and nuanced when necessary, creating the perfect accompaniment for the cast. Titus confidently closes out Opera Theatre of St. Louis’ the 42nd season with a work that is all encompassing in its passion, emotion and potent theatrics, which leaves viewers awed and utterly satisfied.